Filed to: How Deep Is Your Love For This Fish?Filed to: How Deep Is Your Love For This Fish? How Deep Is Your Love For This Fish? 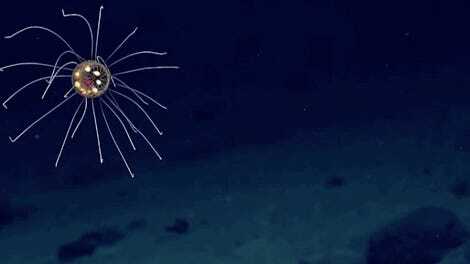 Normally, if a story about deep water sea creatures comes along it involves horrifying abominations of nature that have been hardened by some of the toughest conditions for life on planet Earth. But a team of researchers from Japan recently documented the deepest living fish ever seen, and it almost seems like it’s waving hello to all of us surface dwellers. In May, members of the Japan Agency for Marine-Earth Science and Technology (JAMSTEC) and the Japan Broadcasting Corporation (NHK) teamed up to explore the depths of the Mariana Trench using a new hadal-lander with 4K video cameras. Traveling roughly 7,500 to 8,180 meters below the surface, the lander had mackerel attached on the front to attract the vicious critters that lurk below. 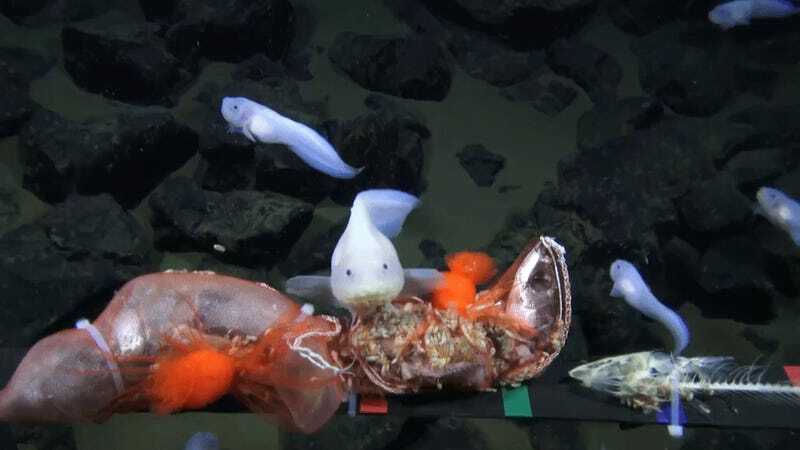 To the team’s surprise, more and more snailfish began to gather around, and when the team checked out the numbers, these little dudes set a new record for the deepest fish ever seen. At 8,178 m, the snailfish beats the previous record holder by 26 meters. The researchers believe that this fish is the same as the “Mariana snailfish” that has previously been spotted at depths of up to 8,080 m. It seems the species is even tougher than we knew. Some scientists think no fish can survive below 8,200 meters because their bodies wouldn’t be able to produce enough of the osmolyte that helps their cells endure the intense pressure. So this is basically the fish equivalent of those urban explorers that hang by their toes on top of skyscrapers. Check out the lovely footage of our new record holder below. If you happen to be in Tokyo on August 28th, extensive footage of the critters will be on display at a special exhibition at the National Museum of Nature and Science.